The Frostburg State University Department of Music Opera Theatre will present works by English Baroque composer Henry Purcell on Monday and Tuesday, April 15 and 16, at 7:30 p.m. in the Pealer Recital Hall of FSU’s Woodward D. Pealer Performing Arts Center. The concert is free and open to the public. The presentation, directed by Music Department faculty, will feature performances from faculty members Gregory Scott Stuart, baritone; Dr. Joseph Yungen, piano and harpsichord; Francesca Molinaro; soprano; and Scott Rieker; as well as the University Chorale and student solo vocalists and instrumentalists. Guest artists include Lyle Nordstrom, who plays theorbo and is co-artistic director of Mountainside Baroque, and mezzo-soprano Lindsey Paradise. This Opera Theatre performance is an outgrowth of the Opera Workshop course. It is conceived to provide experience preparing and performing in opera, as well as to involve a greater number of students in the performing arts departments, affording a chance to learn skills from and to work in tandem with professional singers and instrumentalists. 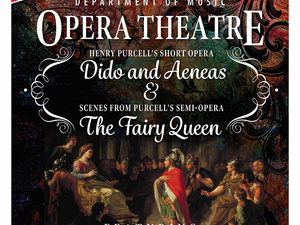 In the “Fairy Queen” scene of the Drunken Poet, the poet will be performed by baritone Ivan Godoy, first fairy by soprano Alana James, second fairy by soprano Jennifer Hartlove and other fairies by mezzo-soprano Jerri Perry, tenor Gabriel Parker and baritone Christopher Hess. In the scene of Corydon and Mopsa, Hess will play Corydon, and Parker, singing counter-tenor, will play Mopsa. In “Dido and Aeneas,” Paradise will perform the role of Dido, Queen of Carthage (Elissa); Trojan hero Aeneas will be played by Stuart on April 15 and Godoy on April 16; Belinda, Dido’s lady in waiting, will be played by Molinaro on April 15 and James on April 16; Dido’s second lady in waiting will be played by James on April 15 and Hartlove on April 16; the sorceress will be played by Godoy on April 15 and Hess on April 16; first witch will be played by Hartlove on April 15 and soprano Ryann Cooper on April 16; second witch will be played by Perry; Elf, the henchman of the Sorceress, will be played by Parker as counter-tenor; and the sailor will be played by Parker as tenor. The instrumental ensemble includes Yungen, Nordstrom, Hanna Livingston on violin, Hana Chitsaz on violin and Maggie Malat on cello and continuo.